You may have seen plenty of stun gun action in the movies. A stun gun is an electrical self-defense device designed to use high voltage to stop an attacker, but cause no serious or permanent injury. Stun guns are legal in most states, but not in New York. Other states that prohibit or restrict stun guns are Hawaii, Illinois, Massachusetts, Michigan, Rhode Island and Wisconsin. The New York Penal Code defines stun guns, which include electronic dart guns and electronic stun guns, as any device designed as a weapon with the purpose of stunning, knocking out, causing mental disorientation or paralyzing a person by sending a high electric shock. A taser is another type of electronic gun, meaning tasers in NY are also illegal. A stun gun temporarily immobilizes someone by delivering a high-voltage electric shock. An electric dart gun ejects darts that are attached to the main device with wires. Once those darts penetrate the skin, they deliver electric volts that temporarily disable the target. There are no self-defense laws in NYC permitting the use of a stun gun. Under New York law, a person is guilty of criminal possession of a weapon in the fourth degree if he knowingly possesses a stun gun. However, peace officers and specified others are exempt from this rule. Other types of weapons are permitted in New York with a valid permit; an individual can carry, possess and buy a handgun if she has a permit. In New York, it is a Class A misdemeanor to possess an electronic dart gun or an electronic stun gun. Penalties include a fine of up to $1,000 and/or imprisonment of up to one year. Additionally, it is a Class A misdemeanor to give, lease, loan or sell an electronic dart gun or an electronic stun gun to another person. Penalties include a fine of up to $1,000, up to one year in jail, or both. It is a Class D felony to dispose of an electronic dart gun or electronic stun gun if you have a criminal conviction on your record. Penalties include a fine of up to $5,000, up to seven years in prison, or both. It is a Class E felony to display, possess or threaten the use of an electronic dart gun or electronic stun gun to further the crime of stalking. Penalties include a fine of up to $5,000, up to four years in prison, or both. TBO-TECH: How Do Stun Guns Work? Claire is a qualified lawyer and specialized in family law before becoming a full-time writer. She has written for many digital publications, including The Washington Post, Forbes, Vice and HealthCentral. Gillespie, Claire. "New York State Stun Gun Laws." 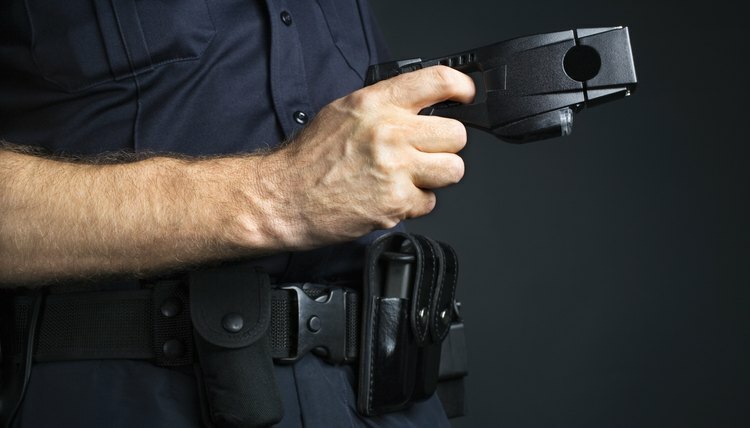 , https://legalbeagle.com/6127413-new-state-stun-gun-laws.html. 23 July 2018.